I love meeting my readers. 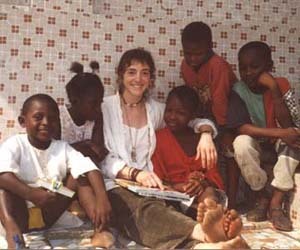 Whether visiting a group of children in a local public school classroom or a compound in a faraway African city, I like to imagine I’m building bridges: between classroom studies, the world of publishing, and the many subjects of my books. My multicultural titles inspire students in the areas of history and global studies. My nature books connect easily to curricula in science. My concept books give kids lots of ideas for writing and art. My programs may be tailored to fit any age group or area of study. For older students and/or longer sessions, hands-on activities in book production and illustration are offered. I am available for single sessions, half and full day programs, and longer residencies. 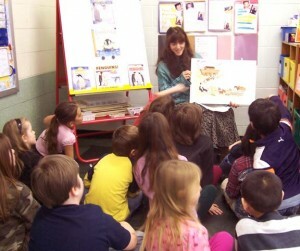 Through BOCES, parent-teacher associations, library programs, and individual grants, I’ve taught in numerous schools in New York state, including a unique 3-year arts-in-ed program piloted through Bard College with a grant from the New York Foundation for the Arts. For more information, please contact me directly by emailing durga@durgabernhard.com. Durga in Guinea, West Africa, reading "Trouble"